The EDGES discovery of the 21cm absorption line at the cosmic dawn has been widely discussed on blogs and in popular press. Quite deservedly so. The observation opens a new window on the epoch when the universe as we know it was just beginning. We expect a treasure trove of information about the standard processes happening in the early universe, as well as novel constraints on hypothetical particles that might have been present then. It is not a very long shot to speculate that, if confirmed, the EDGES discovery will be awarded a Nobel prize. On the other hand, the bold claim bundled with their experimental result - that the unexpectedly large strength of the signal is an indication of interaction between the ordinary matter and cold dark matter - is very controversial. But before jumping to dark matter it is worth reviewing the standard physics leading to the EDGES signal. In the lowest energy (singlet) state, hydrogen may absorb a photon and jump to a slightly excited (triplet) state which differs from the true ground state just by the arrangement of the proton and electron spins. Such transitions are induced by photons of wavelength of 21cm, or frequency of 1.4 GHz, or energy of 5.9 𝜇eV, and they may routinely occur at the cosmic dawn when Cosmic Microwave Background (CMB) photons of the right energy hit neutral hydrogen atoms hovering in the universe. 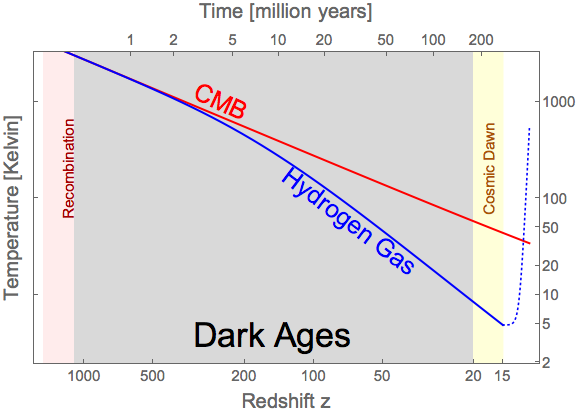 The evolution of the CMB and hydrogen temperatures is shown in the picture here as a function of the cosmological redshift z (large z is early time, z=0 is today). 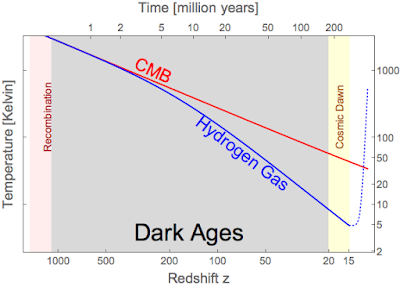 The CMB temperature is red and it decreases with time as (1+z) due to the expansion of the universe. The hydrogen temperature in blue is a bit more tricky. At the recombination time around z=1100 most proton and electrons combine to form neutral atoms, however a small fraction of free electrons and protons survives. Interactions between the electrons and CMB photons via Compton scattering are strong enough to keep the two (and consequently the hydrogen as well) at equal temperatures for some time. However, around z=200 the CMB and hydrogen temperatures decouple, and the latter subsequently decreases much faster with time, as (1+z)^2. At the cosmic dawn, z～17, the hydrogen gas is already 7 times colder than the CMB, after which light from the first stars heats it up and ionizes it again. As the spin temperature cannot be lower than that of the hydrogen, the standard physics predicts TCMB/Ts ≼ 7 corresponding T21 ≽ -0.2K. The surprise is that EDGES observes a larger dip, T21 ≈ -0.5K, 3.8 astrosigma away from the predicted value, as if TCMB/Ts were of order 15. If the EDGES result is taken at face value, it means that TCMB/Ts at the cosmic dawn was much larger than predicted in the standard scenario. Either there was a lot more photon radiation at the relevant wavelengths, or the hydrogen gas was much colder than predicted. Focusing on the latter possibility, one could imagine that the hydrogen was cooled due to interactions with cold dark matter made of relatively light (less than GeV) particles. However, this idea very difficult to realize in practice, because it requires the interaction cross section to be thousands of barns at the relevant epoch! Not picobarns typical for WIMPs. Many orders of magnitude more than the total proton-proton cross section at the LHC. Even in nuclear processes such values are rarely seen. And we are talking here about dark matter, whose trademark is interacting weakly. Obviously, the idea is running into all sorts of constraints that have been laboriously accumulated over the years. One can try to save this idea by a series of evasive tricks. If the interaction cross section scales as 1/v^4, where v is the relative velocity between colliding matter and dark matter particles, it could be enhanced at the cosmic dawn when the typical velocities were at its minimum. The 1/v^4 behavior is not unfamiliar, as it is characteristic of the electromagnetic forces in the non-relativistic limit. Thus, one could envisage a model where dark matter has a minuscule electric charge, one thousandth or less that of the proton. This trick buys some mileage, but the obstacles remain enormous. 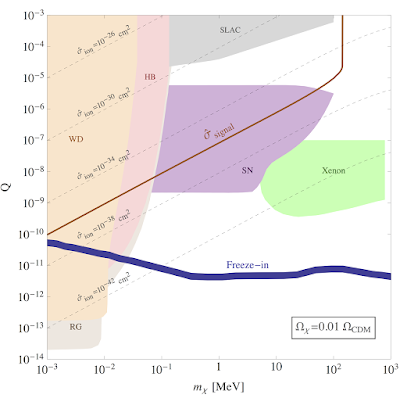 The cross section is still large enough for the dark and ordinary matter to couple strongly during the recombination epoch, contrary to what is concluded from precision observations of the CMB. Therefore the milli-charge particles can constitute only a small fraction of dark matter, less then 1 percent. Finally, one needs to avoid constraints from direct detection, colliders, and emission by stars and supernovae. A plot borrowed from this paper shows that a tiny region of viable parameter space remains around 100 MeV mass and 10^-5 charge, though my guess is that this will also go away upon a more careful analysis.